in his arms. Using the listings of fifteen of his favorite mix tapes, Rob shows that the power of music to build a bridge between people is stronger than death. You’ll read these words, perhaps surprisingly, with joy in your heart and a song in your head—the one that comes to mind when you think of the love of your life. ROB SHEFFIELD is a contributing editor at Rolling Stone. He has been a rock critic and pop culture journalist for fifteen years, and has appeared on various MTV and VH1 shows. He lives in Brooklyn. "No rock critic- living or dead, American or otherwise- has ever written about pop music with the evocative, hyperpoetic perfectitude of Rob Sheffield. Love is a Mix Tape is the happiest, saddest, greatest book about rock'n'roll that I've ever experienced." "This is a lightly-handed, skillful and sincere celebration of pop, of love, sad songs, bad songs and the long, nearly unbearable ache of being a young widower. Witty and wise; a true candidate for the All-Time Desert Island Top 5 Books About Pop Music." 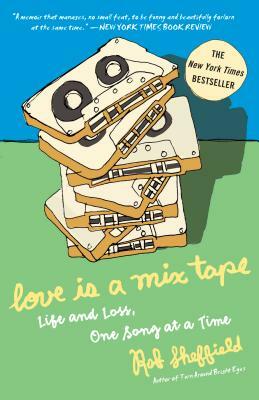 "I can't think of many books as appealing as Rob Sheffield's Love is a Mix Tape; Sheffield writes beautifully about music, he's hilarious, and his story is alternatingly joyous and heartbreaking. Plus, everyone knows there's no better way to organize history and make sense of life than through the mix tape." "A glorious elegy to a pop culture-blessed decade and a tender, unforgettable tribute to the power of love"